Historic photograph of Maxwell’s plaster model (taken by James Pickands II, and published in 1942). 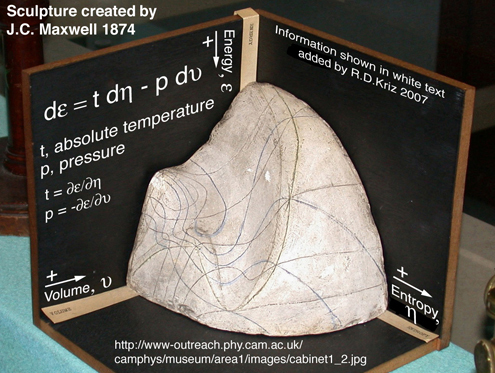 Maxwell’s thermodynamic surface is an 1874 sculpture made by Scottish physicist James Clerk Maxwell (1831–1879). This model provides a three-dimensional space of the various states of a fictitious substance with water-like properties. This plot has coordinates volume (x), entropy (y), and energy (z). It was based on the American scientist Josiah Willard Gibbs’ graphical thermodynamics papers of 1873. The model, in Maxwell's words, allowed "the principal features of known substances [to] be represented on a convenient scale." Gibbs' papers defined what Gibbs called the "thermodynamic surface," which expressed the relationship between the volume, entropy, and energy of a substance at different temperatures and pressures. However, Gibbs did not include any diagrams of this surface. After receiving reprints of Gibbs' papers, Maxwell recognized the insight afforded by Gibbs' new point of view and set about constructing physical three-dimensional models of the surface. This reflected Maxwell's talent as a strong visual thinker and prefigured modern scientific visualization techniques. Maxwell sculpted the original model in clay and made three plaster casts of the clay model, sending one to Gibbs as a gift, keeping the other two in his laboratory at Cambridge University. Maxwell's copy is on display at the Cavendish Laboratory of Cambridge University, while Gibbs' copy is on display at the Sloane Physics Laboratory of Yale University, where Gibbs held a professorship. A number of historic photographs were taken of these plaster casts during the middle of the twentieth century – including one by James Pickands II, published in 1942 – and these photographs exposed a wider range of people to Maxwell's visualization approach. Maxwell's sketch of the isothermals and isopiestics on his surface (Plate IV of his collected letters). Maxwell drew lines of equal pressure (isopiestics) and of equal temperature (isothermals) on his plaster cast by placing it in the sunlight, and "tracing the curve when the rays just grazed the surface." He sent sketches of these lines to a number of colleagues. For example, his letter to Thomas Andrews of 15 July 1875 included sketches of these lines. Maxwell provided a more detailed explanation and a clearer drawing of the lines in the revised version of his book Theory of Heat, and a version of this drawing appeared on a 2005 US postage stamp in honour of Gibbs. As well as being on display in two countries, Maxwell's model lives on in the literature of thermodynamics, and books on the subject often mention it, though not always with complete historical accuracy. For example, the thermodynamic surface represented by the sculpture is often reported to be that of water, contrary to Maxwell's own statement. Maxwell's model was not the first plaster model of a thermodynamic surface: in 1871, even before Gibbs' papers, James Thomson had constructed a plaster pressure-volume-temperature plot, based on data for carbon dioxide collected by Thomas Andrews. Around 1900, the Dutch scientist Heike Kamerlingh Onnes, together with his student Johannes Petrus Kuenen and his assistant Zaalberg van Zelst, continued Maxwell's work by constructing their own plaster thermodynamic surface models. These models were based on accurate experimental data obtained in their laboratory, and were accompanied by specialised tools for drawing the lines of equal pressure. ^ a b Muriel Rukeyser (1942), Willard Gibbs American Genius (reprinted by Ox Bow Press, ISBN 0-918024-57-9), p. 203. ^ a b c d e Thomas G.West (February 1999). "James Clerk Maxwell, Working in Wet Clay". SIGGRAPH Computer Graphics Newsletter. 33 (1): 15–17. doi:10.1145/563666.563671. ^ Cropper, William H (2004). Great Physicists: The Life and Times of Leading Physicists from Galileo to Hawking. p. 118. ISBN 9780195173246. ^ a b Iowa State Chemical Engineer Drives Issue of New Stamp Honoring Father of Thermodynamics: Iowa State University – College of Engineering, 2004 Archived 2012-10-30 at the Wayback Machine. ^ Maxwell, Garber, Brush, and Everitt, p. 49. ^ Ken Brodlie, "Scientific visualization — past, present and future," Proceedings of the Third Workshop on Neutron Scattering Data Analysis, Nuclear Instruments and Methods in Physics Research, Section A: Accelerators, Spectrometers, Detectors and Associated Equipment, Volume 354, Issue 1, 15 January 1995, Pages 104-111, doi:10.1016/0168-9002(94)01031-5. ^ The Museum at the Cavendish Laboratory: Maxwell's Apparatus. ^ Kenneth R. Jolls (1990). "Gibbs and the art of thermodynamics". In D. G. Caldi; George D. Mostow (eds.). Proceedings of the Gibbs Symposium, Yale University, May 15–17, 1989. American Mathematical Society. p. 321. ISBN 978-0-8218-0157-4. ^ Maxwell, Garber, Brush, and Everitt, pp. 50. ^ James Clerk Maxwell, Theory of Heat, revised in 1891 by John Strutt, 3rd Baron Rayleigh: the drawing of the lines appears as Figure 26d on page 207. ^ a b See, for example, Don S. Lemons, Mere Thermodynamics, Johns Hopkins University Press, 2008, ISBN 0-8018-9015-2, p. 146. ^ Johanna Levelt Sengers, How Fluids Unmix: Discoveries by the School of Van der Waals and Kamerlingh Onnes Archived 2007-05-30 at the Wayback Machine, Royal Netherlands Academy of Arts and Sciences, 2002, pp. 56 & 104. ^ a b See the page 3D-Models/Mixtures/Experiments: Kamerlingh Onnes Archived 2004-12-10 at the Wayback Machine from the Royal Netherlands Academy of Arts and Sciences. Some of these models are on display at the Museum Boerhaave: Room 21 Archived 2011-06-07 at the Wayback Machine. Maxwell’s thermodynamic surface at the "Encyclopedia of Human Thermodynamics"
This page was last edited on 6 June 2018, at 14:15 (UTC).